Are you concerned that the economy may be weakening? A wide swath of market-watchers expect the U.S. economy in 2019 to be the worst since the depths of the 2008 financial crisis, potentially putting President Trump in a hole as he heads into his re-election race. Flashback: A year ago, we wrote about a rare and enviable trend: synchronized global recovery. Now, we have synchronized global retreat. Last week was Wall Street's worst in 10 years. If the Dow and S&P 500 finish at their current levels, they'll have their worst December since 1931, during the Great Depression. Bloomberg says the S&P 500 is "one bad session away" from ending the decade-long bull market. Between the lines: Against that backdrop, many in the financial world were agape when Treasury Secretary Steve Mnuchin tweeted, with no real explanation, that yesterday he had "convened individual calls with the CEOs of the nation's six largest banks." "The CEOs confirmed that they have ample liquidity available," the statement continued. Justin Wolfers, a University of Michigan economics professor, tweeted: "If you wanted to create financial market volatility, this is how you would do it." Bloomberg's headline: "Mnuchin Bid to Calm Markets Risks Making Bad Situation Worse." The big picture: Almost everything going on in the world is bad for the economy, Felix Salmon and Dion Rabouin point out in Axios Edge, our weekly look ahead for business. A partial list: Trump attacking the Fed ... the trade fight with China ... China's slowing growth ... a possible Brexit catastrophe ... German and Italian growth slowing ... the French presidency under siege. 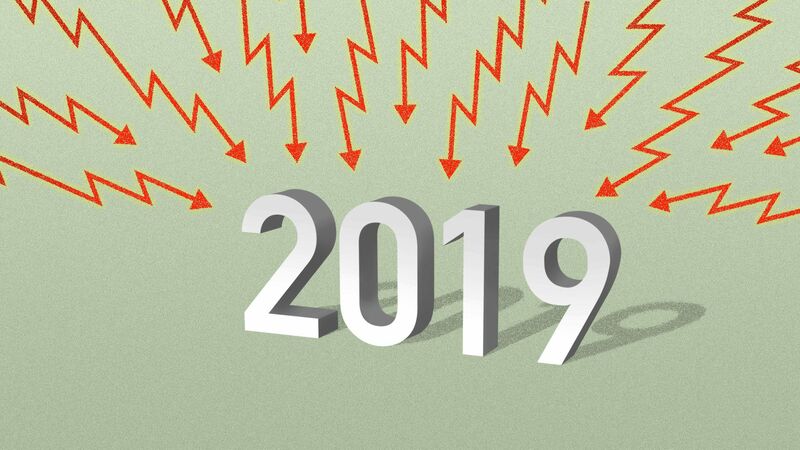 "2019 will begin with a partial government shutdown, fragile markets, and leadership vacuums at the White House, Pentagon, Justice Department, United Nations, and Interior Department — at a minimum." "Some might call that American carnage. Nearly every hard policy catalyst in Q1 of 2019 carries significant downside risk." Another worry, according to Dan Senor, a fund executive and former adviser to Speaker Paul Ryan and Senator-elect Mitt Romney: "If we were to face a real financial crisis in 2019, we will be in much choppier waters than 2008." "In '08, sovereign governments could backstop the crisis in the markets with extraordinary fiscal and monetary measures, and their ability to do so was unquestioned," Senor added. "In 2019, different story." "2008 had ... people minding the shop ... like Hank Paulson, Ben Bernanke, Josh Bolten, Steve Hadley, Condi Rice, Bob Gates, and real deputies who all had the implicit trust of both the president and the markets — and worked together to prevent disaster." Jon Hilsenrath, The Wall Street Journal's global economics editor, writes: "Most private economists expect U.S. growth to slow in 2019. ... Global economic growth accelerated in sync in 2017. In 2018, as the U.S. accelerated further, Europe, Japan and China all slowed." Be smart, from Axios markets editor Dion Rabouin: "The market is looking for a hero because everything is terrible right now around the globe." And he notes this dissonance: "Everything is terrible, but the U.S. data is still good so most traders and fund managers are seeing this as a buying opportunity. ... But the algos don't buy it." P.S. A bit of perspective from Bloomberg: "Even with its 17 percent drop over the last three months, the S&P 500 has risen 18 percent since Election Day."